2018 Season Information. Over 35s Football is a competition for female (over 30) and male (over 35 and over 45) footballers involving teams from the inner and northern suburbs of Brisbane. The competition has been in existence since the winter of 2011. 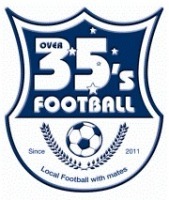 The purpose of Over 35s Football is to provide football players in these ages groups with an opportunity to play local football, predominately on a Friday night in a relaxed, social environment with mates. Teams are organised into a number of divisions - Womens 30s, Mens 35s (Divisions 1 to 5) and Mens 45s (Divisions 1 and 2). Our season will kick off on Friday 16 March for the Men's Divisions and Friday 13 April for the Women's Division. Each season consists of 18 fixture rounds and a Finals Series. Games consist of 2 x 40 minute halves, with a 5 minute half time break. A referee is appointed to control each game (no assistant referees are used) and referee’s fees form part of individual’s registration fees. Unlimited interchange is allowed. Team Registration fees are $2,410 per team for Men and $1,410 for Women, and includes 18 player registrations, player accident insurance, referees fees and for new teams, two match balls. Additional player registrations will be charged at $15 per player. You can register your team for the 2018 winter season using the following link.